Making it easy for guests to see is critical in any outdoor lighting setup. Outdoor step lighting can help you achieve this while keeping the safety and security of your guests in mind. 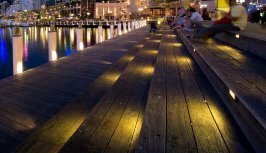 Step lighting is usually an overlooked detail in outdoor lighting but its importance in the overall feel of your outdoor environment is second to none. Before you begin your journey into step lighting, remember to keep design and function in full view prior to making your final decision. Here we will discuss a few concepts that are relevant to think about when deciding on the perfect outdoor step lighting. Step lighting may not be the highlight of your outdoor display but it's very important in putting the whole lighting design together. Lets look at different ways to use step lighting and allow the whole outdoor lighting design to flow easier. When lighting any steps, its important to know your guests' traffic patterns so that you can easily decide on your step lighting design. If you have a wide staircase, knowing your guests' traffic patterns will give you insight into whether to light your steps all the way across or light one side only. If you don't know your guest's traffic patterns, no worries. Outdoor step lighting can be used to help direct traffic throughout your landscape. This can be accomplished by lighting the side of the staircase you want your guests to use. If both sides are being used, it is best to light both sides of your staircase. You may also decide to use recessed outdoor lighing and add your fixtures into a sidewall, allowing you to keep the fixture out of plain sight while it projects it's light directly onto the stairs. Size up your fixture to the adjacent wall and make sure the fixture is not too big or small. Since these fixtures are permanent, you don't want themto be too large or too small in comparison to the overall wall size. Before buying any outdoor lighting fixtures, take a piece of paper and trace a stencil of the fixture you have in mind onto the paper. Cut it out and tape it onto the wall you intend on installing your new fixture. Stand back and look to see if the fixture's size fits well on the wall. The mounting height of recessed step lights will dictate how many steps you can successfully light before creating a shadow effect on the steps below. If the fixture is centered directly over one step, the fixture will only provide light onto one step effectively. A fixture installed at the intersection between a tread and a riser will provide adequate light onto approximately two steps. Fixtures mounted higher on the wall will light even more steps but may give off softer light output. Take into consideration the wall's color and how the fixture blends into it. Does the fixture fit the overall setting and the atmosphere you want to create? You may decide to use strip lights across the width of the staircase. These are usally installed underneath the overhang of each step. They tend to last a very long time without maintenance but you may have to replace the whole strip if one lamp fails. Step lighting fixtures mounted on alternate sides of the of a staircase are unappealing. They usually leave dark spots causing confusion to people using the staircase. Spacing your lights too close will often draw too much attention to your step lights taking away from the whole design and feel of your outdoor environment. Select a fixture with a lamp shield that provides enough cover when seen from below. You don't want to blind people walking up your steps. Making outdoor step lighting a part of your lighting design will make your outdoors warm and inviting. Guests young and old can enjoy feeling a sense of safety when walking around at night.